Property investors in Qatar could be “burnt twice in less than a decade” if the country was to lose the right to host the 2022 World Cup as the Fifa scandal unfolds, experts have warned. Property prices and land values have soared around most of the 12 stadia under construction as developers pile into the luxury sector, according to a new report by the property search website, Lamudi.com. “The Fifa World Cup has contributed to the increase in developers in Qatar, affecting the prices of areas where stadiums are being built, as well as in neighbouring areas… developers have resorted to building luxury property as opposed to affordable housing because of the higher return on investment and higher margains,” the report read. 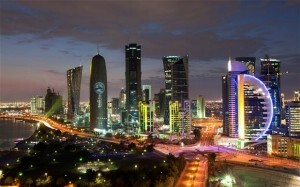 The study from the company – which claims to be the emerging markets equivalent of Rightmove, with 900,000 properties listed for sale or rent in 32 countries – showed that Ash Shamal, home of the proposed Al-Shamal Stadium, had the highest increase in land prices with a 20pc rise from 2011 to March 2015. This was followed by Umm Salal, where land values climbed 19.5pc, and Al-Rayyan (14.6pc). However, property prices and land values could be rocked if the nation was to lose the right to host the World Cup. Prosecutors on Thursday began interviewing Fifa executives involved in the vote that resulted in Russia and Qatar being chosen to host the next two World Cups, as criminal inquiries around world football’s governing body gathered pace. Adam Challis, head of UK residential research at JLL, said that those property speculators who “lost money at the end of the last [property market] cycle could be burnt twice in less than a decade” should the World Cup be pulled. John Collier-Wright, founder of JR Capital, which manages funds in the Middle East, warned “uncertainty” over Qatar’s ability to hold on to the World Cup could cause a temporary downward correction. The Fifa investigation also clashes with Ramadan, which starts in June and coincides with the start of the quiet summer season in the Middle Eastern property market. However, Mr Collier-Wright said instability around the World Cup is small compared with other threats to the region’s economic stability.